Even with initiatives in place to decrease carbon emissions, the continuous burning of fossil fuels has already raised the acidity of the oceans to an unprecedented high, with no current technology in place to balance it. Sir Richard Branson, the British investor and founder of Virgin Group, has promised a prize of $25 million to whoever can come up with a working system for removing carbon dioxide from the air. 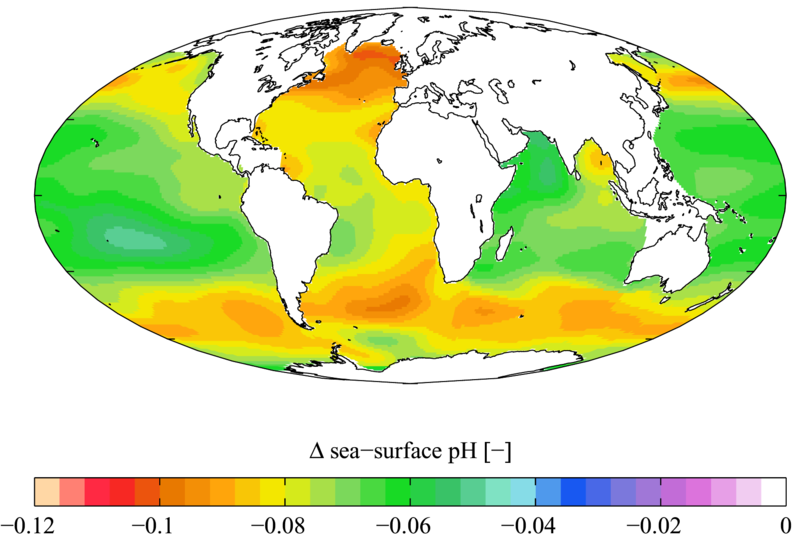 Dr. Sabine Mathesius of the Potsdam Institute for Climate Impact Research in Germany, says, "Even if the CO2 in the atmosphere would later on be reduced to the pre-industrial concentration, the acidity in the oceans could still be more than four times higher than the preindustrial level. It would take many centuries to get back into balance with the atmosphere." Every year, the ocean absorbs about 26% of carbon emissions released into the atmosphere. The last known massive acidification period occurred around 55 million years ago, and was called the Paleocene-Eocene Thermal Maximum. Deep sea shelled invertebrates suffered the most, as many species became extinct while others adapted. Since the beginning of the Industrial Revolution, ocean acidity has increased by 30%.